Hello and welcome to the homepage of Damiths guest house. The beautiful beach of Unawatuna is not far from described hotel/guest house. Unawatuna is not far from Galle in south of Sri Lanka, with historical places and big shopping malls. If you want to go the beach of Unawatuna, Damith, or one of his friends will take you there free of charge. It takes about 3 minutes from the guest house to the beach by threewheelers. If you want to walk, about 10 minutes. There is also bicycles and scooters available for rent. Unawatuna train station is about 500 meters from Damiths guest house. The newbuilt highway stretching from airport ends about 5 km from hotel. 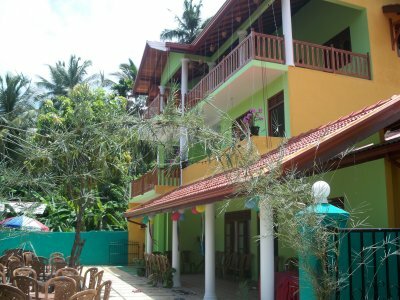 If you need a hotel/guest house in Unawatuna then this accommodation is perfect! The accommodation connected to this homepage is a new built three-storey house with totally 8 units for rent. Big size bed for 2 persons or 2 single beds in each room. Fresh totally tiled bathrooms attached to each unit. Hot and cold water. Fan or AC by request. TV with possibilities for satellite channels if wanted. High-speed Wi-Fi. New beautiful swimmingpool. One big veranda on each floor for eating or resting.Of course we can provide for extra beds for families if needed. Prize for one night accommodation mid-season about 48 USD with AC.Beach-towels, shower-towels and bedsheets of course included. Clothes-washing on demand.The father of the house is wellknown for excellent cooking. He has good experiance in preparing any kind of foods like fish, chicken, seafood or beef. Both Sri Lankan style or western. Damith also has more then 15 years experience working with tourism in Unawatuna. Of course we can provide for excursions for instance to Yala national park, Nuvara Eliya, Kandy or other well-known places all over Sri Lanka. Airport-transfers approx. 90 USD one way for each minibus. © 2012 Unawatuna.org. All Rights Reserved.